CodecEX is a browser add-on that accelerates the file loading so that you can access online videos and images faster than usual. 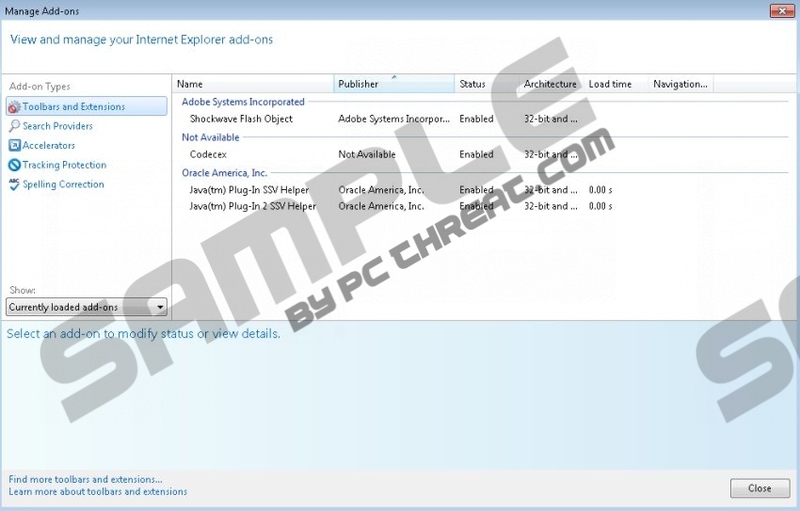 The program is compatible with Internet Explorer, Google Chrome, and Mozilla Firefox and is promoted at codec-exe.info. However, this website is not the only source of the program. CodecEX may be bundled with other programs, such as browser add-ons, media players, and system optimization programs. Very often computer users ignore the license agreement displayed on their screens, which results in the installation of unwanted programs. In order to prevent this, you should pay close attention to every page of the installation wizard. CodecEX is based on the JustPlugIt browser add-on creation engine, which has been used to create many similar browser add-ons, the majority of which are supposed to work as shopping assistants enhancing your online behavior. The JustPlugIt engine was used to created Less2Pay, RoyalCoupon, SaverON, and many other programs, all of which are categorized as adware, and CodecEX is no exception. The program is likely to be developed by Israel-based software developers because the use of the product is governed by the laws of Israel. CodecEX may display advertisements that have nothing to do with your browsing interests. For instance, when browsing a shopping website, you may be invited to install an update for your Internet Explorer or take part in an online survey. It is highly advisable to ignore such advertisements because some of them may be associated with insecure websites. Advertising-supported browser add-ons are often used by wicked software distributors to spread malware, and, if you want to protect your personal information, you should remove CodecEX from the computer as soon as you can. CodecEX does not endorse third parties, which means that you use the program at your own risk. You should also bear in mind that the program may be monitoring you so that the developers of the program can draw some conclusions about your browsing behavior. If you have no intention of using CodecEX and want to remove it from your browsers as soon as you can, you should do it right now. We recommend that you implement SpyHunter because this security program is capable of terminating various Internet-based computer infections, including ransomware infections, browser hijackers, adware program, Trojan horses, fake anti-virus program, and many other threats. It is possible to uninstall the program because it creates its uninstaller in Windows Control Panel, but you should bear in mind that your operating system needs protection, and a spyware and malware prevention tool is by far the best option. Once you uninstall the unwanted program, implement our recommended scanner. Click the download button, install the program, and launch a system scan. If necessary, invest in the program. Quick & tested solution for CodecEX removal.